Your swimming pool or spa is much like a fine wine, the more attention you pay towards it’s contents, the better it makes you feel during enjoyment. During the fall we see a huge increase in organic materials dropped into your swimming pool. This lso brings additional contaminated materials to your swimming pool such as bacterial and phosphates. If this was the case in the summer, your pool would instantly turn green. 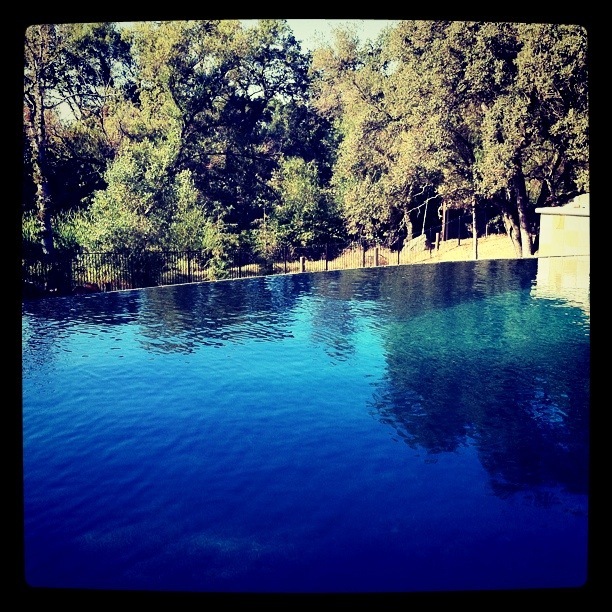 However in the winter your pool water is colder and therefore life has difficulty pro-creating under these conditions. Often home owners allow their swimming pools to sit still, and sometimes turn off their filtration pump. This is the worst idea possible when attempting to cut costs. What you save now will only be multiplied when trying to remove this organic material from your swimming pool. The purpose of your pump and filter is to remove microscopic materials from your water. So come spring, your pool doesn’t turn into a lagoon. With all this ranting I think it’s important we break this down as to what is an acceptable Winterizing Procedure may be for both the budget and the non-budget. Let’s start with the budget method . Step one is simple, do not ever shut down the filtration or filtration pump. If you are not certain as to how much your pool pump is costing you then call us or even your local power company to calculate this number. You might be surprised how little it will cost you to run the pump 1-2 hours per day (at the least). Filtration is key for any swimming pool at anytime. So if you wish to only do one thing, this is it. Step Two is to confirm you have working filtration. This is generally pretty easy to do: Grab a large 44oz cup of sand, and throw it into your skimmer basket. If you see any sand shooting its way back through, then you have a leak located inside your filter. If not, then continue. Raise your chlorine to a level of 5 PPM. This can be accomplished with liquid chlorine. And for only a few $’s. By raising your chlorine and keeping it between 5-10PPM all winter season long, you will limit the amount of possible growth, and in turn make for an easy spring clean up service. Now for the Non-Budget Service; everything above will still applies, however there are three additional procedures. The first is to add a chemical treatment to your swimming pool. This treatment will allow the minerals found in almost all foliage to LIMIT the staining that CAN occur on your plaster from leaves. I use this in my swimming pool and it works. The second is to install a pool cover or net. The idea is you want to limit the amount of leaves from entering your swimming pool and then decomposing underwater. The last comes in the spring time, after you remove all leaves and whatnot from the water, and before temperatures get above 70 degrees. This is the final procedure and it is called a phosphate treatment. This will eliminate all organic residual which will later cause algae. This treatment is needed in almost EVERY Sacramento swimming pool. I know because we have serviced over 1000 to date. So get that bacteria out with a phosphate service. It’s simple and easy and most treatments will last longer than a year. So Sacramento for this season It’s the easiest investment you can make this season. Success comes from Attitude & Preparation: make spring shine! And given there are not always immediate rewards You will feel the difference that a clean swimming pool can make.